Edward Fisher, Robin Youngs, Musheer Hussain, Jonathan Fishman,	The Journal of Laryngology & Otology, Volume 130 Issue 5, p 417. R Mills, I Hathorn,	The Journal of Laryngology & Otology, Volume 130 Issue 5, pp 418-424. N Jufas, N Patel,	The Journal of Laryngology & Otology, Volume 130 Issue 5, pp 425-430. A Walker, P Surda, M Rossiter, S Little,	The Journal of Laryngology & Otology, Volume 130 Issue 5, pp 431-434. E Yeheskeli, R Abu Eta, H Gavriel, S Kleid, E Eviatar,	The Journal of Laryngology & Otology, Volume 130 Issue 5, pp 435-439. I Aladag, M Guven, M Songu,	The Journal of Laryngology & Otology, Volume 130 Issue 5, pp 440-446. M E Dinc, S Ulusoy, A Is, N N Ayan, M O Avincsal, C Bicer, O Erel,	The Journal of Laryngology & Otology, Volume 130 Issue 5, pp 447-452. 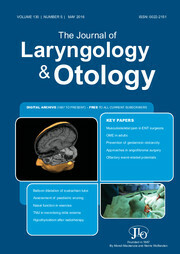 B Galletti, R Santoro, V K Mannella, F Caminiti, L Bonanno, S De Salvo, G Cammaroto, F Galletti,	The Journal of Laryngology & Otology, Volume 130 Issue 5, pp 453-461. A Mishra, S C Mishra, V Verma, H P Singh, S Kumar, A M Tripathi, B Patel, V Singh,	The Journal of Laryngology & Otology, Volume 130 Issue 5, pp 462-473. M Motiee-Langroudi, A Amali, B Saedi, H Emami, F Ensani, A Lotfi, M Rabbani Anari,	The Journal of Laryngology & Otology, Volume 130 Issue 5, pp 474-477. J R Alba, J Basterra, J C Ferrer, F Santonja, E Zapater,	The Journal of Laryngology & Otology, Volume 130 Issue 5, pp 478-481. S D Sharma, H Kanona, G Kumar, B Kotecha,	The Journal of Laryngology & Otology, Volume 130 Issue 5, pp 482-489. Occupational musculoskeletal pain amongst ENT surgeons – are we looking at the tip of an iceberg? A Vijendren, M Yung, J Sanchez, K Duffield,	The Journal of Laryngology & Otology, Volume 130 Issue 5, pp 490-496. A N Elsamanody, V Topsakal, W Grolman, R A Tange,	The Journal of Laryngology & Otology, Volume 130 Issue 5, pp 497-500. P Capaccio, M Gaffuri, S Torretta, L Pignataro,	The Journal of Laryngology & Otology, Volume 130 Issue 5, pp 501-505.